1. Disclaimer: NO PURCHASE NECESSARY to participate or win. A purchase does not increase your chances of winning. All federal, state, local, and municipal laws and regulations apply. VOID WHERE PROHIBITED, taxed and/or regulated. Abt Electronics, Inc. (“Sponsor”) does not own any logos or other intellectual property used by it, or by any entrant, in connection with this Contest, including, but not limited to, the intellectual property of LG Electronics, Twitter, Facebook, and Instagram. 2. Eligibility: The Abt Electronics, Inc. LG Styler Giveaway (“the Contest”) is open to any legal resident of the fifty (50) United States and the District of Columbia, excluding Puerto Rico, who is 18 years or older at the time of entry and who is located in the United States. All employees of Sponsor, participating vendors, and all associated entities and each of their respective affiliated companies, subsidiaries, sales representatives, distributors, licensees, or agents, and the immediate family members (spouse, parents, child, sibling(s) and their respective spouses) of, and those living in the same household (whether related or not) of all employees of the foregoing entities, are not eligible. All applicable federal, state, local, and municipal laws and regulations apply. Void where prohibited or restricted by law. Each entrant who submits an electronic entry must be the rightful owner of the profile and/or account identified in the entrant’s entry at the time of registration. Use of computer programs and other automatic means to enter the Contest is prohibited and will result in disqualification. By submitting an entry electronically, the entrant represents that his or her entry complies with any and all applicable terms and/or conditions of use, rules, or requirements governing the use of the third party (i.e., non-Sponsor) website(s). Sponsor reserves the right to deem ineligible any entry that, in Sponsor’s sole opinion, may be in violation of any of the terms and/or conditions of use, rules, or requirements governing the use of any third party site. Normal internet access and usage charges imposed by any online services may apply. 3. Entry: The Contest will begin at 12 p.m. (CDT) on September 1,2018 and all entries must be received by Sponsor no later than 11:59 p.m. (CDT) on September 30, 2018 (the “Contest Period”). Sponsor’s computer will be the official time clock for the Contest. or by “Retweeting” the Twitter post announcing the contest (https://twitter.com/abtelectronics/status/1035942358720958464). Only one bonus entry will be given per Social Media method of entry. All entries—regardless of entry method—must be received by Sponsor no later than 11:59 p.m. (CDT) on September 30, 2018.
individual who: tampers, or attempts to tamper, with the entry process or the operation of the Contest; violates the Rules; or acts in an unsportsmanlike or disruptive manner, or with intent to annoy, abuse, threaten, or harass any other person. Sponsor’s failure to enforce any term of these Rules shall not constitute a waiver of that provision. If, for any reason, the Contest is not capable of running as planned, including, but not limited to, infection by computer virus, bugs, tampering, unauthorized intervention, fraud, technical failures, weather, a cancellation of the game for any reason beyond the control of Sponsor, or any other causes beyond the control of the Sponsor that corrupt or affect the administration, security, fairness, integrity, or proper conduct of the Contest, then the Sponsor reserves the right in its sole discretion to cancel the Contest and, if appropriate under the circumstances (in Sponsor’s sole discretion), select a winner in a random drawing from among all eligible entries received prior to cancellation. The entrant agrees that the entrant’s uses of an internet service provider, Twitter, Facebook, and/or Instagram are subject to those sites’ terms and conditions and so agrees to indemnify, defend, and hold harmless Sponsor and each of Sponsor’s affiliated companies, directors, officers, employees, representatives, partners, and agents from any and all claims arising out of, or related to, the entrant’s use of such sites and services. 6. General Release: By participating in the Contest, the entrant releases Sponsor and each of Sponsor’s affiliated companies, directors, officers, employees, representatives, partners, and agents from any liability whatsoever for any claims, costs, injuries, losses, or damages of any kind arising out of, or in connection with, the Contest or with the acceptance, possession, or use (or non-use) of any prize (including, without limitation, claims, costs, injuries, losses, or damages related to: personal injuries; death; damage to, loss, or destruction of property; rights of publicity or privacy; defamation; or portrayal in a false light). 1, 2018. Odds of winning depend on the number of eligible entries received. 8. Winner Notification and Acceptance: Winner will be notified via e-mail. On or about October 1, 2018, Sponsor may post the winner’s first name, last initial, and home city/state on the Contest landing page located on Sponsor’s website (www.abt.com), and use social media channels to post this information, after the winner has been notified and his/her eligibility confirmed. Return of prize notification as undeliverable may result in disqualification, and an alternate winner may be selected. Winner may waive his/her right to receive the prize. The prize is not assignable and is not transferable. No substitutions are allowed. The winner is solely responsible for reporting and payment of any taxes on prizes. The winner may be required to complete an affidavit of eligibility, a liability and publicity release (except where prohibited by law), and a tax acknowledgement form, which must be returned to Sponsor within three (3) days. Failure to sign and return the affidavit and/or release within three (3) days, or to comply with any term or condition of these Rules, may result in a winner’s disqualification and the award of the prize to an alternate winner. Except where prohibited, participation in the Contest constitutes the entrant’s consent to the publication of his or her name, biographical information, and likeness in any media for any commercial or promotional purpose, without limitation or further compensation. For a copy of the Rules or the Winner List (available on or about September ), send a self-addressed, stamped envelope (unless prohibited by law) to the following address: (Please specify whether the “Official Rules” or “Winner List” is being requested) – LG Styler Giveaway, c/o Digital Marketing Coordinator, 1200 N. Milwaukee Ave. Glenview, IL 60025. 9. Construction: All issues and questions concerning the construction, validity, interpretation, and enforceability of these Rules, or the rights and obligations of any entrant and/or Sponsor, shall be governed by, and construed in accordance with, the laws of the State of Illinois, without giving effect to any choice of law or conflict of law rules or provisions (whether of Illinois, or any other jurisdiction) that would cause the application of the laws of any jurisdiction other than Illinois. The invalidity or unenforceability of any provision of these Rules shall not affect the validity or enforceability of any other provision. In the event that any such provision is determined to be invalid or otherwise unenforceable, these Rules shall be construed in accordance with their terms as if the invalid or unenforceable provision were not contained therein. 10. 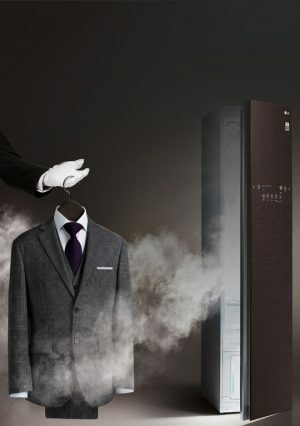 Sponsor: The LG Styler Giveaway is sponsored by Abt Electronics, Inc., whose decisions regarding the selection of a winner and all other aspects of the Contest shall be final and binding in all respects. The Contest is not sponsored by, endorsed by, administered by, or associated with any internet service provider, Twitter, Facebook, or Instagram. Sponsor will not be responsible for typographical, printing, or other inadvertent errors in these Rules or in other materials relating to the Contest. Please direct any questions about the Contest to marketing@abt.com.